The Libertarian Party had to choose in 2016 between a recycled Republican convert to some individual rights, an Anti-choice, Pro-coathanger infiltrator and a wealthy roué noob who had evidently only heard of the LP six months earlier. The party recycled Gary Johnson–stripped of his pandering promise to try to overturn the Supreme Court’s Roe v. Wade decision enforcing individual rights for everyone–even pregnant women. Recognizing that women have individual rights (instead of trying to coerce them) multiplied this mediocre candidate’s vote total by 328% compared to 2012. Any attempt to inject anti-choice fanatics onto Libertarian Party candidate offerings can safely be interpreted as sabotage intended to cost the LP 2/3 of the votes we earned. Expect the Republican party to invest a lot of cash and effort in that. Such pandering reverses huge gains from the 1972 election in which the LP plank literally put a stop to coercing pregnant women and doctors in These States and Canada. 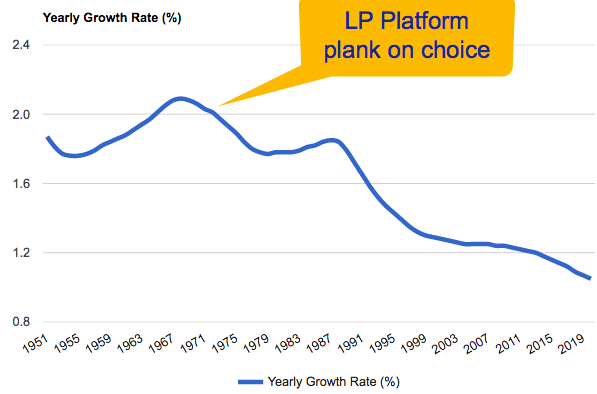 By making the Libertarian plank on birth control the lead paragraph in its Roe v. Wade decision the Supreme Court recognized the importance of individual rights, helped avert global Malthusian disaster and made the LP a change agent that cannot be ignored. The Democratic Party, painfully aware that the LP beat them to the repeal plank just as the Liberal party did in 1931, has tried to exploit women’s rights as transfer payments from producers to women as a way of grafting Soviet or Chinese socialism onto the issue. But suppose there are women out there who want to be free, NOT kept, bought or bribed? NARAL is betting there aren’t any, and doesn’t want women to know how Libertarian Candidate Toni Nathan smacked nine old men upside the head with the repeal plank and helped make Canada a Sanctuary Country for ladies. So, how many women want to sacrifice their rights in order to ban electric power? NARAL has become a totalitarian socialist lobby with an agenda indistinguishable from CPUSA. The Democratic party is in the coils of the same anaconda. A self-respecting independent woman has nowhere to turn but the Libertarian Party if she wants individual rights enforced. Suicidal Dems, Greens and Socialists are the ones that helped God’s Own Prohibitionists win political offices. Just as the Dems copy communist planks, the Gee-Oh-Pee copies Comstock Law and Prohibition Party planks to again strip women of rights (including physicians’ right to life). Remember the Amendment to make Pregnancy Termination Illegal? The one the Prohibition party published in its 1976 plank after Roe v. Wade? The GOP has quietly copied that into every platform up to and including the 2016 campaign. Libertarians are meanwhile promising to follow Canada’s example of no government guns pointed at pregnant women or their physicians. Are rights worth giving up to save Chinese communism? I’m voting libertarian and I’m not even female! Ever need a translator, born in the 20th century, tempered by immigration court?